A wedding isn’t just any day, it’s the day, a day that some have been planning their whole life. One of the fundamental (and most exciting) aspects of planning a wedding is gathering inspiration for that big day. What dress, shoes, venue, flowers and hair will create the ideal mood, atmosphere and look to celebrate your special day? After saying “Yes” to the dress, hair is easily the most important aspect of a bride feeling beautiful, comfortable and most like themselves - the best version of themselves. So what happens when a bride’s hair is too thin to achieve her ideal style, or she’s too short on time to grow the length she needs? Great Lengths comes to the rescue. This summer, the Great Lengths Canada team helped Bride-to-be, Chelsea, achieve the long, luscious locks she had always wanted for her June wedding. Using just two bundles, Great Lengths Canada educator, Dee Gauthier, gave Chelsea the enviable volume and longer locks needed to achieve the style she wanted on her wedding day. Before Great Lengths, Chelsea’s hair was very fine and thin. Because of this, her hair would not hold curls, even when styled at a professional salon. On her wedding day she wanted her hair to feel as effortless and beautiful as she’d always hoped. The bridal transformation began with an in-person consultation with Dee to determine the appropriate course of action to achieve her desired look; number of bundles, colours needed, and length. On the day of the application, Dee worked her magic with two bundles of 20” extensions in the colour 1B. Before applying the extensions, Dee washed, cut, dried, and styled Chelsea’s hair. After the application, Dee again cut and styled Chelsea’s hair so the extensions and natural hair blended beautifully. Prior to her Great Lengths, Chelsea had never even worn clip-in extensions, so the process was completely new to her, and she was pleasantly surprised with the experience. 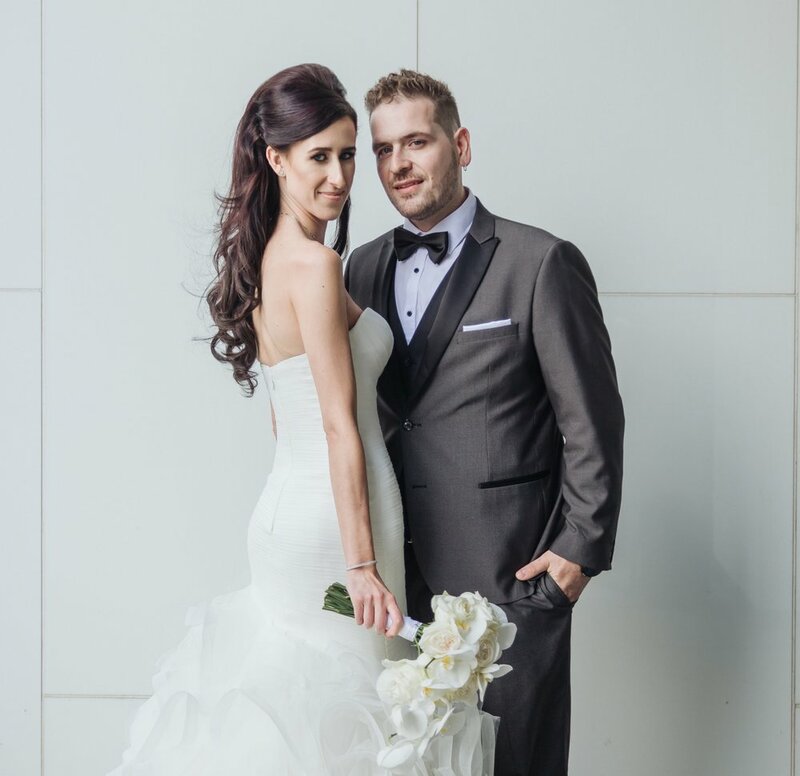 Chelsea’s wedding took place in Toronto on June 2, 2018 – a beautiful, sunny day. With a ceremony and cocktail hour that took place in the outside courtyard of the Liberty Grand Entertainment Complex, and a reception that took place inside in the Artifacts room, the wedding had a beautiful, romantic vibe, emphasized by the many white orchids, candles and hints of purple throughout. Her bridal hairstyle was equally beautiful and romantic; long, flowing and curly with volume. She wore her hair half up, half down, with a lot of height in the front, and she couldn’t have been happier. 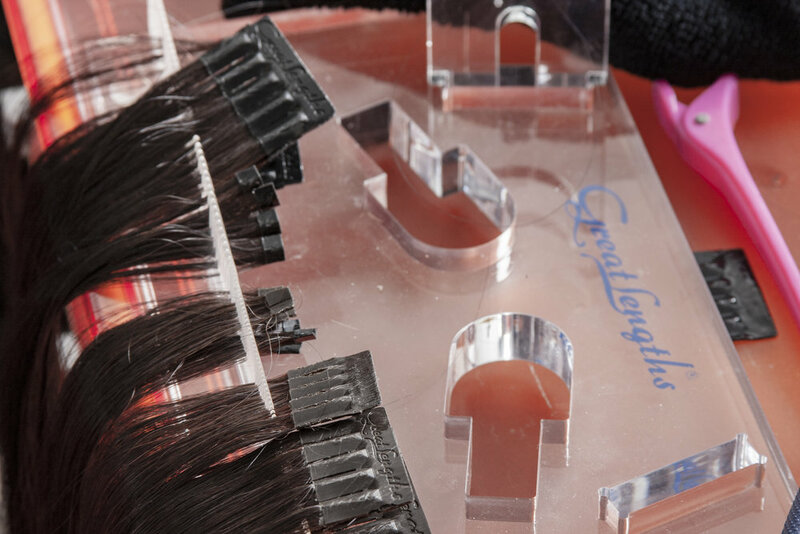 Great Lengths hair extensions are available in over 60 different colours to seamlessly match any natural hair. They are perfect for adding volume and length to help create a bride’s dream hair, and because they incorporate into the hair so naturally, strand by strand, they give the freedom to style hair in any way desired. A wedding is a bride’s day to shine, and a hairstylist’s opportunity to help make that happen. Through consultation, our Great Lengths stylists can help any bride make her dream hair a reality on the big day. GL Makeover on Marilyn Denis!